Welcome to our fireplace door and firescreen page! A fireplace door can dramatically change the appearance of your fireplace. We offer fireplace doors and firescreens from one of the premier fireplace door manufacturers in the country! 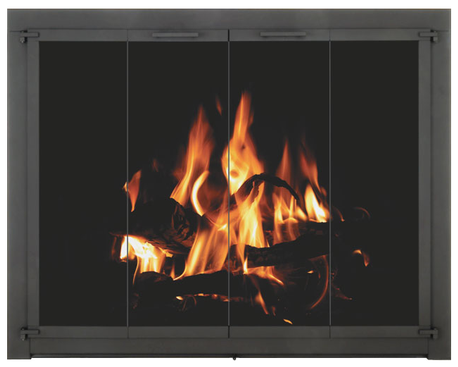 Stoll Fireplace Glass Doors & Enclosures. These 100% steel doors come with a wide range of options to choose from. You pick the colors, screens, door handles, and more. Stoll fireplace doors are custom made to order! Delivery time is 4-6 weeks for all doors. Service call to measure for your fireplace door and review options is required. Service call is $85.00 and up with price depending on location and the distance we have to travel to get to your home. Service call for door appointments takes approximately one hour. Not only do we offer stoll fireplace doors but manufacturer made fireplace doors and custom made firescreens are available as well. In order for us to locate a manufacturer made fireplace door we will need the make and model of your fireplace. Most factory built fireplaces have a metal tag somewhere in the box area that will have this information on it. You may either provide this information for us, or you can setup a service call, and one of our technicians can come out & determine this for you. If the fireplace is not too old, and we can obtain the make and model information we need, manufacturer fireplace doors are available to order. We also offer hanging fireplace screens for both zero clearance factory built fireplaces and custom built masonry fireplaces.